Tarleton Junction is a major waterways place minor waterways place place on the waterways major waterways place village town city at the junction of the Leeds and Liverpool Canal (Rufford Branch) with the River Douglas. Rufford Old Hall (Ancient Half Timbered Manor House. National Trust Property) is on the Leeds and Liverpool Canal (Rufford Branch), 4 miles and ¼ furlongs and 1 lock to the south. 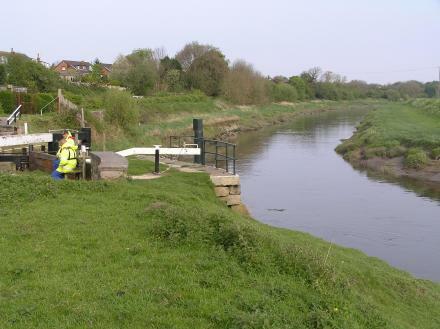 Douglas Mouth (Junction of River Ribble and River Douglas) is on the River Douglas, 4 miles to the northwest. The nearest place in the direction of Rufford Old Hall is Tarleton Lock (Tidal lock to the River Douglas); ¼ furlongs away. The nearest place in the direction of Douglas Mouth is River View Pipe Bridge; 2¾ furlongs away. Tarleton Lock and the canal go off to the left. The river level is nearly deep enough in this photo (it's tidal) to set off for the Ribble Link. Preston — 1319 yards to the southwest. church view, tarleton, Preston, PR4 6UW — 1436 yards to the south. Unit 2, 10 Station Road, Preston, PR4 6SN — 1558 yards to the northwest. Taunton — 1515 yards to the south. Preston — 1336 yards to the south. bank bridge, Tarleton, PR4 6HJ — 1441 yards to the south. Bank Bridge, Preston, PR4 6HJ — 1493 yards to the south. Tarleton — 1183 yards to the south. Preston — 1436 yards to the south. Manor House Farm Manor House Farm, 52, Church Rd, Tarleton, Preston, PR4 6UQ — 1348 yards to the south. Bretherton — 1533 yards to the southeast. Liverpool Old Road, Preston, PR4 4RJ — 1523 yards to the northeast. Preston — 834 yards to the south. Preston — 1342 yards to the northwest. 40 Hillcrest Drive, Tarleton, PR4 6AY — 264 yards to the west. Preston — 199 yards to the west. 212 Liverpool old road much Hoole, Preston, PR4 5JU — 1616 yards to the northeast. 24 Station Road, Preston, PR4 6SN — 1602 yards to the northwest. Tarleton — 1482 yards to the south. Tarleton Courtyard, Church Road, Tarleton, PR4 6UP — 1319 yards to the southwest. Goosefoot Stables, Hoghton, Preston, PR5 0SG — 1624 yards to the northwest. 264 hesketh Lane, Preston, PR46RJ — 1476 yards to the northwest. Hesketh Bank, PR46SN — 1564 yards to the northwest. 264 Hesketh Lane, Preston, PR4 6RJ — 1476 yards to the northwest. Preston — 1164 yards to the northwest. Preston, PR4 6 — 417 yards to the southwest. 9 Moss Lea, Preston — 157 yards to the west. 73b Church Rd, Tarleton, PR4 6UP — 1142 yards to the southwest. Preston — 1277 yards to the south. 5 merlecrest drive Tarleton, Preston, PR4 6BD 0 — 188 yards to the west. 10 Station Road, Hesketh Bank, Preston, PR4 6SN — 1551 yards to the northwest. 1325 yards to the southwest.